If you live in Douglasville, GA and are looking for an HVAC company you can trust to repair, maintain or replace the air conditioning system in your home, welcome to ClimateSmith LLC. We are a full service heating and air conditioning company that has proudly served West Atlanta for over twenty-six years with fast, reliable and affordable HVAC repair, maintenance and installation services. Give us a call today to talk to one of our experts about your heating and air conditioning needs! At ClimateSmith LLC, we have the air conditioning products and HVAC services you need at prices you can afford! Our goal has always been to provide unparalleled service to our clients. We stay at the front of our marketplace by employing highly-skilled, highly trained technicians and by participating in continuous education and training. We also save our clients money by offering the most energy efficient equipment and techniques that the industry has to offer. If you hire us to service, repair or replace the heating and cooling system in your home, you can expect prompt, courteous service and competitive prices. We will strive to provide your family with courteous, expedient and professional service of the highest caliber. For your peace of mind, our company is fully licensed, bonded and insured. We also stand firmly behind our work and offer warranties on all the services we provide. We are happy to provide you with a free estimate or to give a second opinion on an estimate you have already received from another company. As an added benefit for our clients, we offer a free service call on every repair. When the air conditioning system in your home goes out, you need a company that will respond promptly and quickly get your system back up and running again. That company is ClimateSmith LLC. Please give us a call today to obtain a free estimate or to schedule an appointment. We look forward to serving you and your family. 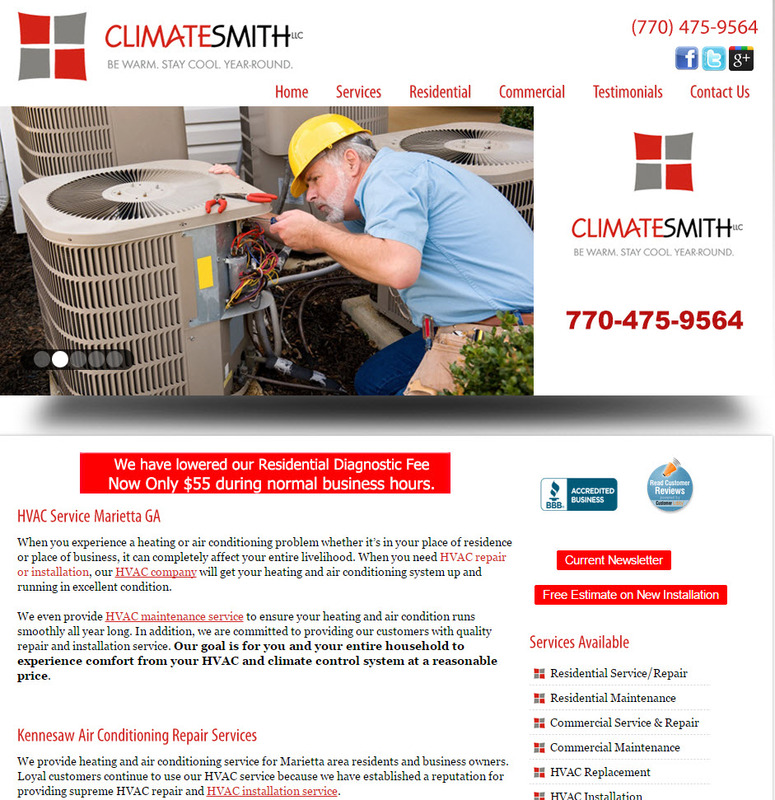 ClimateSmith LLC serves clients in the West Atlanta area with top quality HVAC service, repair and installation at affordable prices.